5 Tips For Going Green At Trade Shows | Displays and Exhibits, Inc. Going green has become an important part of doing business, and doing your part to help the environment. Thanks to accommodating display and exhibit providers, the ways to go green at trade shows are vast and continually expanding. As more and more families, brands and businesses make the conscious effort to go green, working with others that share their values becomes a higher and higher priority. The movement shows all those you engage with that while you care about cutting down for economic draws; you also care to preserve the ever-floundering environment and its resources. Convention centers, hotels and other big businesses making the move have acted as a great catalyst for the smaller umbrellas of businesses and brands they do business with to follow suit. From their missions to increase building efficiency to decreasing energy consumption, water and waste, these trade show hosts are helping to change the way brands look to do their exhibiting. 1. Display and exhibit providers make it easy for brands to be a part of the green movement by offering materials made free of toxins. From the stands, to the banners to the graphics, toxin-free, environmentally friendly and recyclable materials have little price difference than their standard counterparts, but a large impact on reducing your footprint. 2. Lightweight and compact materials like aluminum are perfect for trade show pop-up and banner structures because they limit the need of shipping. Having pieces that easily pack and roll away means brands can travel with their own marketing tools instead of having to relying on shipping from location to location. No longer do brands have to waste resources sending their setups around the globe ahead of time, when they can conveniently travel right alongside them. 3. 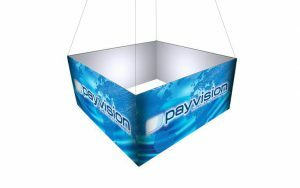 Utilizing LED lighting in booth displays is a great way to dramatically decrease the power consumption of your exhibit. Available everywhere, energy efficient lighting is a simple switch that’s nearly effortless to make. 4. Eliminating paper product from your booth is the most obvious and budget-saving change to going green. Instead of using business cards, brochures, flyers and other waste that often gets lost in the shuffle, booths can choose to move their content online and utilize iPad and handheld technology. From contact captures to virtual lookbooks to QR codes printed on reusable banners and backdrops, going paper-free can only benefit your brand and booth’s efficiency. 5. Swag has typically taken on a useless notoriety, but when takeaways are designed around being environmentally conscious, they can become much more useful. Whether it is using recycled or repurposed materials to lower impact or choosing purposeful items that can be used over and over again, going green at the swag table is an essential step. As a competitor, being able to boast that (along with the business the trade show is held in) you too are promoting green efforts, can immediately gain an edge in reputation and brand perception within the industry. With so many green and inexpensive options available within the trade show exhibiting industry, there is no reason why brands should choose not to participate in the movement.